What Day Of The Week Is July 4? 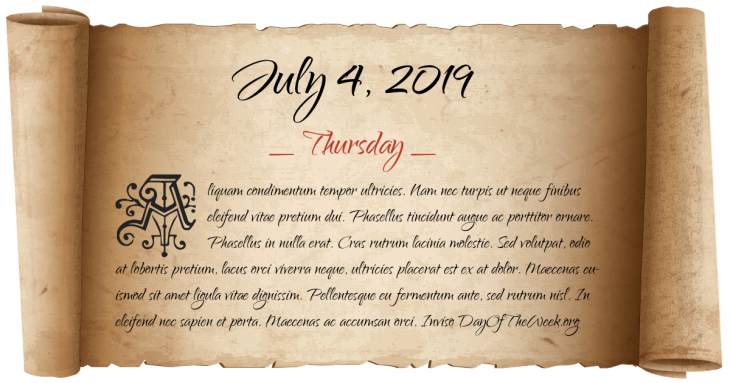 July 4, 2019 is the 185th day of the year 2019 in the Gregorian calendar. There are 180 days remaining until the end of the year. The day of the week is Thursday. Samuel Francis Smith wrote My Country, 'Tis of Thee for the Boston, MA July 4th festivities. The Army of Northern Virginia withdraws from the battlefield after its loss at the Battle of Gettysburg, signalling an end to the Southern invasion of the North. Thoroughbred horses Ten Broeck and Mollie McCarty run a match race, immortalized in the song Molly and Tenbrooks. The “Indian Independence Bill” is presented before British House of Commons, suggesting bifurcation of British India into two sovereign countries – India and Pakistan. A court in Czechoslovakia sentences American journalist William N. Oatis to ten years in prison on a charge of espionage. Who were born on July 4?